It is the time of the year when morning gives me a sudden surge of anxiety as my birth calendar confronts me with a mocking grin right straight on my face, loud and clear, telling me that waking up today is another reality that I am getting 365 days more to add to my age. The fact that I have been celebrating my 2_th birthday since the day I exited the adolescence hood and the teen promenade era, and the hard truth that I am actually getting close to the age where most men should be at their most peak (which I dissent to admit, I still have a long way to go) – give me multitudes of reasons to just stop counting. But then, my age, as I realize is starting to overcount the number of days in a month and I have not owned (yet) a house and car, has caught me off-guard and I do not want to die of anxiety attack. Before it gets the cool in me, I rose up and sat on the edge of my bed, and uttered a short thank you prayer. At least, I get to reach this age, still warm and breathing. The past 365 days (or at least the half of it) is by far the most challenging and the most heart-wrenching chapter of my human existence. I was forced to give up my job to recuperate from a health condition and my bank account is running nowhere but bankrupt as I had to face the pain of meeting my daily needs and expenses without any means of replenishing anything that I spent out. But just like a sturdy tree in the midst of wilderness, no matter how terrible the weather is or how strong the wind it may cast on, I remained faithfully standing on my feet, getting better and stronger than ever. I owe this not only to myself but also to the people who never leave me by my side and stay as supportive while I am taking my baby steps all the way to recovery. I cannot thank them more for keeping me afloat all day as I deal with these entire plight. As I celebrate my birthday today, I personally cooked some treats to be given to the guys and girls who backed me up during my ordeal as a sign of my gratitude. Browsing my fingers on the internet, I came across with a sweet course that was originated from a place that, just like me, has been tried by the inevitable nature in the past few months. I have never figured out that preparing some simple sticky rice cakes could become so meaningful to me. 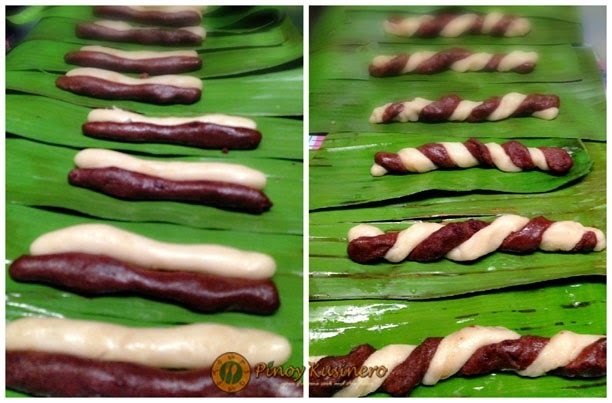 Suman Moron or Twisted Chocolate-Milk Sticky Rice Cake is a native dessert in the Island of Visayas, Philippines more particularly in Tacloban – the capital city of Leyte. Leyte is a home for beautiful people with unfaltering smiles and unique cookery. 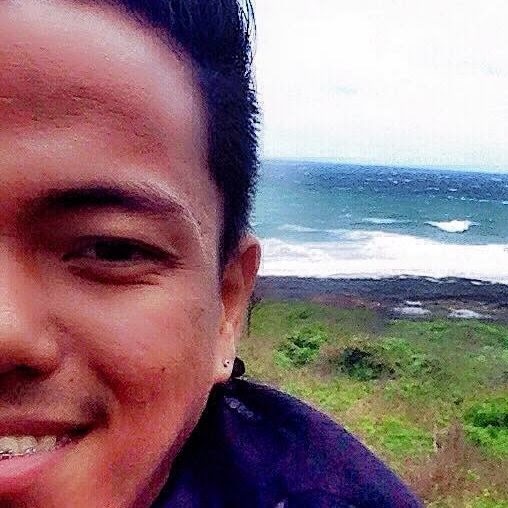 Its shore is witness to the historic return of the great Gen. McArthur (the man behind the country’s liberation during Japanese invasion era) and the same province that has just recently devastated by a super typhoon named Yolanda (international name Haiyan). Never to get confused with the harsh insult associated to a word we commonly found in the English dictionary, “moron” must be pronounced quickly with a slight stress on the second syllable to refer to a sweet treat made from the mixture of malagkit (glutinous rice), ordinary rice, coconut milk or crème, evaporated milk, sugar, vanilla and the main ingredient responsible to its fame – cocoa or chocolate powder. If you happened to visit Tacloban and someone offered you a moron, you already know not to get offended right away. Other variants are mixed with crushed peanuts and sliced cheese for added flavor. And just like any suman (sticky rice cake) in the country, it is generally wrapped in fresh banana leaves with both ends secured with tied strings or simply folded. The wrapping process is a unique art in itself as there a lot of ways to do it, depending on the available indigenous materials and the region where the suman is made. This delightful delicacy that gives you a balance of gentle chocolaty scent with a hint of vanilla but not overpowering the mild sweetness of the soft-textured rice is a favorite local pasalubong (take home treat) and a popular table fare during fiestas and other special occasions. I never grew up in Tacloban. In fact, I have never been there. In the past few months, the whole world were all eyes on them as the region experienced a horrific devastation by the earthquakes and super typhoons which successively took place in just a matter of weeks. As I watch them on the television news on my nice and comfortable bed, I just could not imagine the spirit and resilience they got in their veins of having to wake up the next day without their homes and livelihood, or worst, having to deal with the loss of a number of the members of their family (there was even an instance where almost an entire clan was wiped out). It was heartbreaking to listen to the stories of the bereaved children who lost their parents while trying to save their lives on the onslaught. I really feel for my fellow countrymen. With this, another realization just struck me – that we are commingling creatures designed to face our own plight in life and how we overcome it, depends on how we deal with it. Your load could be heavier or lighter than anyone else because God knows how far you can go. He will never cast on you something that is beyond your capacity and He is the only one who holds the perfect formulation for that. With what I have gone through and been going through, I feel lucky, somehow, that my family and I do not live in the Visayas as I have no idea where to pull enough courage to pick up and dust myself off the deep abyss if ever a fortuitous event as unfortunate ever happened to us. Indeed, there are countless reasons to be happy and grateful for. The special dessert that I made is also my way of paying tribute to my beloved Taclobanons who, in one way or another, helped me understand that life, just like this twisted chocolate and milk sticky rice cake, is sweetness and bitterness entwined together. 1. Cook the milk and chocolate suman separately. In a mixing bowl, combine the ordinary rice and glutinous rice flour. Add the white sugar and mix until well blended. Place the mixture in a non-stick pan. Pour the evaporated milk, coconut milk and the vanilla extract, stirring continuously until all the ingredients are evenly distributed. Continue stirring over medium heat until the mixture is thick and smooth. In a mixing bowl, combine the ordinary rice and glutinous rice flour. Add the brown sugar and cocoa powder, and then mix until well blended. Place the mixture in a non-stick pan. Pour the coconut milk and add the vanilla extract, stirring continuously until all the ingredients are evenly distributed. 2. Prepare the banana leaves for wrapping. Cut the leaves into desired sizes and pass over heat until wilted. Brush with butter or margarine so the suman will not stick on the leaves. 3. Take a heaping tablespoon of milk suman and roll into a long tuber shape with your hands. Make sure that the length will fit into the banana leaf, leaving enough space on both ends (about ½ inch). Do the same process to chocolate suman. 4. Place the two tube-shaped suman side by side on a piece of cut banana leaf. Twist them to form a thicker tube with the two colors entwined together. 5. Roll over and wrap tightly with the banana leaf. Tie both sides with strings to secure. Repeat steps 3 to 5 until all the suman mixtures are wrapped. 6. Put the wrapped suman on a steamer or double boiler and steam for 30 to 45 minutes until cooked. 7. Unwrap the suman and place on plate. Top with condensed milk and chocolate syrup, and then drizzle with roasted nuts and niyog. You can serve it hot or cold. Enjoy! Crushed roasted nuts can be mixed to the chocolate mixture during cooking to add more flavor. You may also add a slice of cheese in the rolled milk suman. You may eat the moron with or without toppings as the suman itself is already flavored with milk and chocolate. Moron is not only perfect for dessert you can also have it paired with your morning coffee or chocolate drink. You may allow the suman to cool and store in the fridge. It can actually last up to one week. These came out delicious, salamat po for posting. However, they are much firmer than the suman moron in Tacloban.. There, they are softer. You are great, ENZ! I am from Taft. Samar, and this particular dessert is also popular in Samar especially during Christmas. Although I have been away from the Philippines for 49 years, my sisters and I make suman during special occasions. Thanks for sharing. Keep up your good work in promoting our heritage and God bless you always! Sir, san po ba banda sa leyte mkakabili nyan? Can I make this with only rice flour and no glutinous rice flour?